Q1: My Neighborhood has a lot of graffiti that appeared over night - HELP? Q2: How do I file a report about a discrepancy involving a Police officer? A2: The Independent Policy Auditor reports to the City Manager and follows up with discrepancies with officers. You may reach Liana Perez at 520-837-4003. Q3: Who can I talk to about Tenant rights? A3: Call the Consumer Fraud Complaints: Attorney General's Office at 628-6504 and refer to the Landlord/Tenant Act. Q4: I need information regarding on-line tax forms and city tax codes? 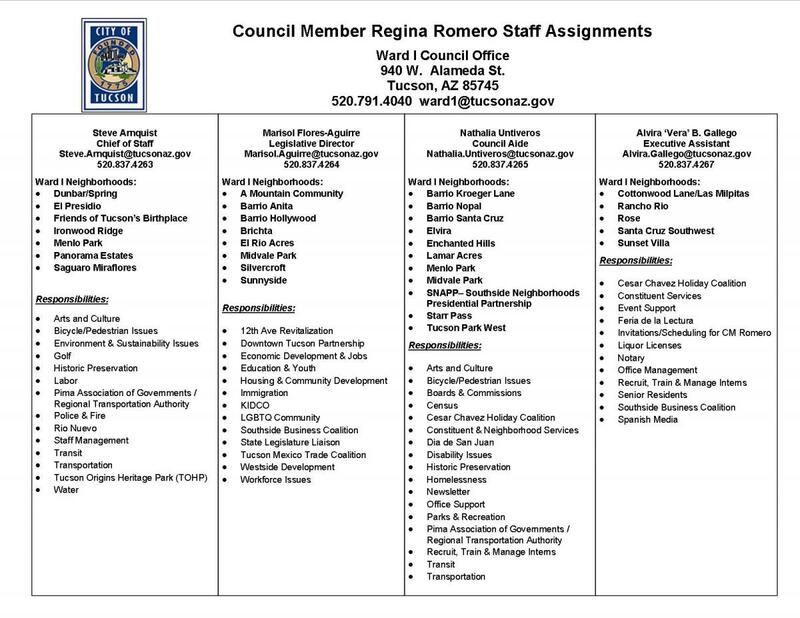 A4: Call the City of Tucson Finance Department @ 791-4566. Q5: Where can I get a vendor permit? A5: Call 791-4873. An event permit is $20, District Park is $60 per month, and Regional is $120 per month. Q6: Do I need a permit to build a wall or enclose my garage? A6: Yes. Conformance to development codes that pertain to building safety is required depending on the project. For information, go to the FAQ page of the Development Services website or call 791-5550, for the City of Tucson's Development Services Department. Q7: How can I find out if the zoning is appropriate for a development starting in my area? A8: Contact Zoning Enforcement in the Development Services Department at 791-5550. Q9: What transportation projects are under way or in the beginning phases of construction in the City of Tucson? A9: Visit the City of Tucson's Transportation Department website for information on current projects. Q10: How can I get speed humps or other traffic mitigation done on my street? A10: Call the Transportation Department's Neighborhood Traffic Management Division at 791-4259 and ask about the Mayor and Council's Neighborhood Traffic Mitigation Program. Q11: I live in an apartment complex that doesn't offer recycling. How can I participate? A11: There are Neighborhood Recycling Centers in Tucson. For NRC locations and other helpful information, go to the City of Tucson's recycling website. You can also get more information on waste reduction through Tucson Clean and Beautiful at 791-5000 (or visit their website at https://tucsoncleanandbeautiful.org/ ). Q12: What Ward or Precinct do I live in, and is there a Neighborhood Association in my area? A12: If you have access to the internet you can check out the Jurisdictional Search or contact the Department of Neighborhood Resources at 791-4605, and then follow up with your Council Ward office. Q13: Who do I contact for a Neighborhood Clean-up? A13: Contact your Neighborhood President or neighborhood contact person, and follow up with the Department of Neighborhood Resources at 791-4605. Q14: What's the best way to find a book I need or find out about events at the library? Q15: I know someone who is elderly or I am someone elderly who, is there an agency that can help me and runs programs targeting me? A15: Check out the Pima Council on Aging (PCOA) for more information at https://www.pcoa.org/.